MoonMachine 2 comes housed in the case of Horological Machine Nº8. The stripped-down case construction of HM8 emphasised the illusory nature of the projected hours and minutes, and MoonMachine 2 uses the same mechanism to highlight the visual impact of a moon disc. The projection is accomplished via an optical prism, which refracts vertically the hours, minutes and moon discs. A pusher on the side alows quick and easy adjustment of the moonphase display. The battleaxe rotor of HM8 has been transformed into an openworked radial web of titanium with Sarpaneva’s signature golden moon, and the sapphire crystal pane has been metallised in a similar pattern. Natural titanium case, white gold moon faces, light blue sky and rotor. Black titanium case, white gold moon faces, dark blue sky and rotor. Red gold and titanium case, red gold moon faces, anthracite sky and rotor. Bi-directional jumping hours, trailing minutes and moon phase displayed by one optical prism that reflects vertically. The hour and minute segments are magnified by 20%. MoonMachine 2 uses the same mechanism than the projected hours and minutes of the HM8 to highlight the visual impact of a moon disc appearing in a space too small to fully contain it. The battle-axe rotor of HM8 has been transformed into an openworked radial web of titanium, echoing the design vocabulary of Stepan Sarpaneva’s best-known work. The sapphire crystal framing the top of the engine has been metallised in the same pattern as the rotor, drawing focus to the variable sheen of the brushed titanium rotor as it rotates. He first graduated from the Finnish School of Watchmaking and then moved to Switzerland to further his studies at WOSTEP. In 1994, he began work for several prestigious watch companies including Piaget, Parmigiani, Vianney Halter and Christophe Claret. During those 10 years in Switzerland, Sarpaneva specialised in the crafting of complicated timepieces. Stepan’s three signature themes are all celestial: his very distinctive moon face; the northern stars and constellations; and the crenellated form of his Korona case – the korona/corona is the plasma atmosphere of the Sun. His incredible sense of design and sense of detail give his work – and everything he surrounds himself with – a very powerful coherence. 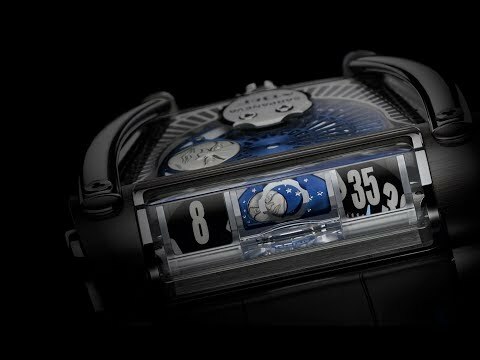 In 2012, when the first MoonMachine was presented, the MB&F-Sarpaneva connection was the first time that a piece of MB&F Performance Art had been produced in conjunction with another watchmaker. The evolution of this partnership is represented by the advancement between the first MoonMachine, which was based on the HM3 Frog, and MoonMachine 2. They both utilise the rotor and moonphase display as locus points for incorporating the Sarpaneva contribution, but MoonMachine 2 takes this seemingly straightforward addition and gives it an exponential bump: a world premiere, the first ever projected moonphase display. Maximilian Büsser and Sarpaneva began talking of a sequel to MoonMachine not too long after its release, when HM5 was announced; Stepan suggested that a moonphase indication could go between the hours and minutes of the first Horological Machine to use the optical prism display. It wasn’t until HM8, however, four years after MoonMachine, that this became more than a suggestion and laid the foundations for MoonMachine 2. MoonMachine 2 is available in three limited editions of 12 pieces each.